Is it just me, or is the Continuity State going through a period of existential crisis? Actually,this politician has got it right. (Amazingly). If a referendum was run now, it would be lost. It would also stir old ghosts, and “Divisiveness” as well. But give it time. Inexorable events and developments will work their effects on the situation. I think once BREXIT has actually taken place, or nearly happened, then cold reality will prevail.I give it three years max. Yes, but the post-Brexit shock is likely to fade very fast as people get used to the idea. Perhaps strike while the iron is hot? Certainly for a party supposedly supporting reunification to be lukewarm every time the idea is actually raised says much about the core of the SDLP, even if plenty of good folk fill its edges. That is not SDLP knocking, just an observation on some of its leadership class. They are Alliance Party types with a green flag. As I have previously stated, I believe I will see a reunited Ireland in my lifetime. The Brexit vote has certainly hastened it. The implication and fall out from this vote has yet to manifest properly. This uncertainty is caused simply by the fact that the UK Govt literally has no plans at all. The big moment will come when Article 50 is actually triggered. I am strengthened in my belief for two reasons. Lesley Riddoch (http://www.lesleyriddoch.com) in her second-last/third-last podcast had boiled down the situation to a hard/policed border between Scotland/England & NI/The Republic. Once the border is up, then the game is up too. Secondly, if Niall Horan of 1D can comment coherently on this situation, you know that this is something monumental. NI is truly at the crossroads in determining its future and I can assure you that future is not going to be within the UK. 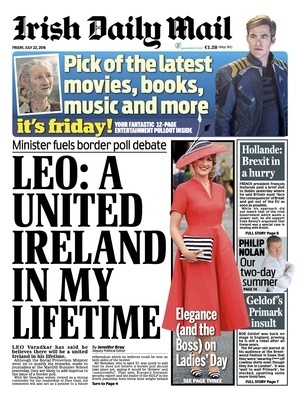 er, how can the two states be “reunited” when they were never united in the first place? There is one nation state on the island of Ireland. The north-eastern part of that nation-state was partitioned from the rest of the country and retained under the colonial rule of a neighbouring nation-state when the latter withdrew its colonial rule from the greater part of the island. The UK-administered Six Counties is neither a state or a country or a province.